Niki Lauda leapfrogged his McLaren team-mate Alain Prost in the drivers' championship thanks to his win at the Österreichring. In the end he stuttered over the line as his gearbox had failed but that was of no concern to the 150,000 spectators who revelled in a victory for the local hero. It was the only home success for triple champion Lauda. McLaren came into the weekend in such dominant form that Prost could admit in interviews he and Lauda had an agreement that whichever one of them led with ten laps do go would be allowed to take the win. "That's the moment the team bosses have chosen for us to stick to our positions," he said. "It's to avoid the possibility of running out of fuel if we tormented each other right to the finish." The race had to be started twice after a shambolic first attempt. As the lights went green Elio de Angelis stalled his Lotus. As the field set off, the red light was re-activated causing half the cars to stop. Those at the front, with the exception of Lauda, on the second row behind Nelson Piquet, Prost and de Angelis, went on. At the second time of asking Prost led away but was soon passed by Piquet while Patrick Tambay, benefiting from soft tyres, moved third before he was forced into an early pit stop. By this point Prost was leading, but in trouble, driving with one hand on his gear lever to avoid it popping out. It proved decisive as again de Angelis took centre stage. On the 27th lap his Lotus started belching smoke and then flames, but instead of abandoning it he decided to slowly drive back to the pits, depositing oil on the track as he went. Marshals were slow in waving the warning flags and at the Rindtkurve Prost hit the slick. With only one hand on the steering wheel, Prost was unable to avoid spinning off into the barriers. Piquet also found the oil but just about kept going, helped by having both hands to battle the spin. 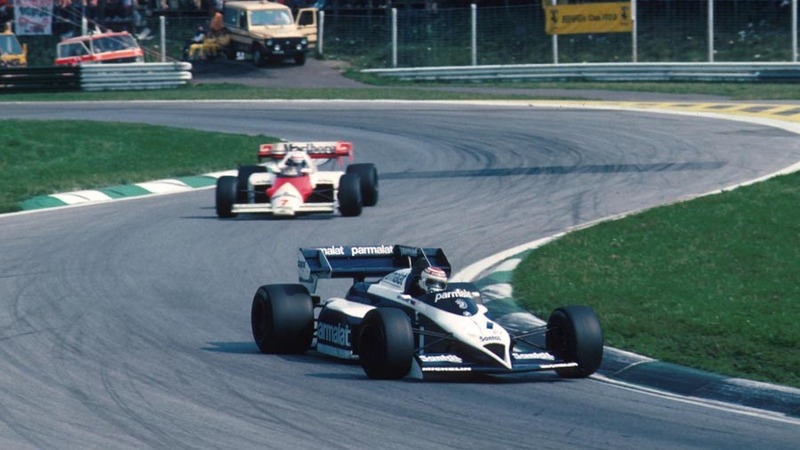 Piquet, his Brabham showing unusual reliability, took up the lead but was hunted down by Lauda who he allowed to pass with little resistance as he decided his priority was to preserve his deteriorating tyres. Then 10 laps from home, Lauda slowed and lifted his arm to indicate he was in trouble. He had lost fourth gear and nursed the ailing car home using third and fifth. Piquet's safety-first strategy paid off as he finished second with Michele Alboreto third. The race had been predictably attritional. Both Williams' failed to make the halfway point, while Ayrton Senna seemed on course for third when his Toleman expired. The Lotus' of Nigel Mansell and de Angelis were both left smoking by the side of the circuit. Gerhard Berger, on his F1 debut in an ATS, impressed before losing his gearbox three laps from the end. Beneficiaries of this were Arrows who ended with both drivers - Thierry Boutsen and Marc Surer - in the points.